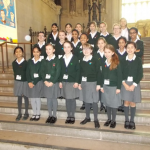 On Thursday 5th March, Year 6, together with Mrs Maggs-Wellings, Mrs Windsor, Mrs Brighton and Mrs Young, went on a very special visit to the Houses of Parliament. The coach pulled up outside Parliament’s Portcullis House. We got out, went through security and were given tags. We then stepped into “The World of Politics”. Portcullis House is modern, with trees and fountains and lots of light. It is where the MPs and other government workers have their offices. Then we went down the escalators into the Victorian building of the Palace of Westminster. Did you know that there are over 1000 rooms and two miles of corridors in the building? Statues of the lion and the unicorn flanked the entrance and it smelt of history and old books. We walked up the narrow staircase to the public gallery and there below, we could see the floor of the House of Commons! The speaker – John Bercow was sitting in The Speaker’s chair. We had to be extremely quiet. It was so interesting listening and watching the MPs debate. We saw the royal mace too. This object represents Her Majesty’s presence in the chamber. Next, we were taken to the Central Lobby. We found ourselves standing under an ornately decorated mosaic and richly painted ceiling. On all four sides of the Lobby were mosaics of each of the four saints of the United Kingdom. 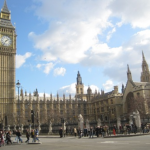 We were then taken to Westminster Hall – the oldest (and coldest!) part of the Palace of Westminster. The magnificent hammer-bean roof is the largest medieval timber roof in Europe. It was in this great hall that Guy Fawkes and Charles I were tried for treason – and we all know what happened to them! After visiting Parliament, we even had time to sketch and have lunch by the River Thames – with the pigeons too! We then paid a visit to St Margaret’s church, (next to Westminster Abbey). Overall – a perfect day!